Our high-quality roller banner printing offers unrivalled value for money. Using only the finest materials and inks, we ensure your print is picture perfect. Plus they are available in a range of sizes to suit your designs, from 800 x 2000mm up to a giant 1500 x 2000mm. Need it fast? Same day roller banner printing is available on our 800mm x 2000mm and 850mm x 2000mm Roller Banners! Simply select the Same Day option, visible on weekdays before 11am, and we will print your Roller Banner that day and send on a next day courier service. Our roller banners are printed on one side in full colour with eco-solvent inks. They are simple to look after too, with quick assembly and water resistance for a wipe clean finish. These roller banners are both compact & lightweight, and are complete with a free travel bag for hassle-free transportation. At 610gsm, this PVC is strong with heavy duty block out too. 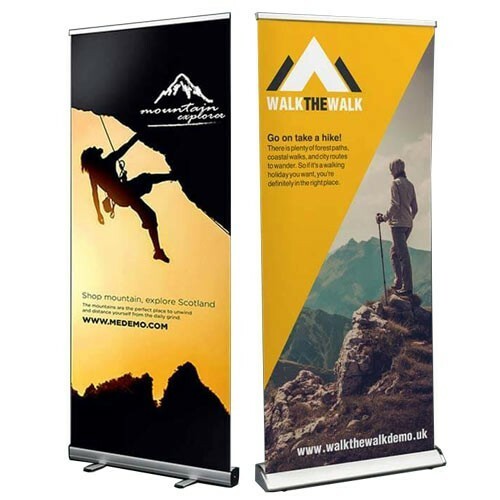 Upgrade to our 610gsm PVC Premium Roller Banner for longer-term promotion. With a heavy duty base featuring hidden legs and a tough support mechanism, Premium Roller Banners are built to last. The stylish chrome detailing offers an enviable finish to this printed roller banner. Please note that 800mm wide roller banners will be supplied in an 850mm cassette and will therefore have a small gap on either side of the graphic. Compact and lightweight pop-up banner for exhibitions and conferences, available in sizes from 800 x 2000mm to 1500 x 2000mm. Compact and lightweight pop-up banner with a heavy duty, attractively styled Premium cartridge, available in sizes 800mm or 850 x 2000mm.